The rain and hailstorms that struck Chile’s central regions last week will not derail the country’s fruit export growth this season, according to the country’s Agriculture Minister Antonio Walker. Speaking at an event in the O’Higgins Region to mark the first cherry shipment of the new season, the minister said fruit exports were still on course to rise by 5.5 per cent to US$18bn in 2018/19. 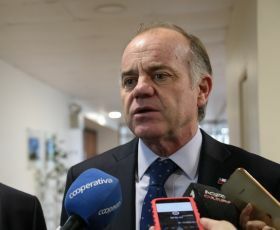 Walker described fruit exports as the driving force in Chile’s economic growth, reaching more than 140 countries worldwide and generating more than 750,000 jobs. “The sector directly accounts for 3 per cent of GDP, and 13 per cent if you take into account all the services it generates,” he said. The minister noted that last week’s storm losses, which impacted mainly the O’Higgins and Maule Regions, were likely to be around US$120m, which would not threaten the industry’s export target. “The impact will be regional, rather than national, and there’s no doubt that we’ll still reach our export total of US$18bn this year,” Walker said. According to Asoex president Ronald Bown, the inclement weather will result in a loss to the sector of US$150m and lead to a 3 per cent fall in fruit exports in 2018/19.